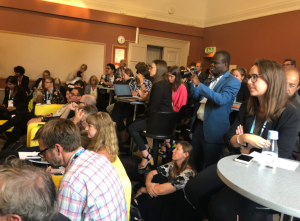 In late August 2018 Prof Paul Whitehead attended the World Water Week in Stockholm. This is the annual focal point for the globe’s water issues. It was attended by over 3,300 individuals and around 380 convening organizations from 135 countries participated in the Week. Experts, practitioners, decision-makers, business innovators and young professionals from a range of sectors and countries come to Stockholm to network, exchange ideas, foster new thinking and develop solutions to the most pressing water-related challenges of today. The Water Prize attracts many entries each year; this year the junior prize went to two students from Singapore for producing reduced graphene oxide, a material that can be used to purify water, from agricultural waste products. Paul attended many sessions and found these to be at a high level covering global issues with quite a focus on Africa this year. A strong reason for attending the meeting was to make contacts with others in the Water Sector, often at quite high levels. Paul rapidly got involved in a UN Habitats initiative to try to close the Sustainability Development Goal gaps, and in particular, ensure the provision of secure water for the entire world’s population. UN Habitats and other organisations (e.g. WHO) are very keen to close this gap; it is a massive task but projects are beginning to have an impact, in terms of new thinking and new methodology. Meetings were well attended with people standing or sitting on the floor to get a space (see photo below). 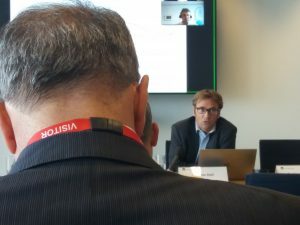 Paul found himself in the Dutch Embassy attending a packed event and discussing a wide range of topics from the MaRIUS Drought Project to new ways to measure the environment using biosensors, plus trying to persuade the Dutch to invest in Oxford Molecular Biosensors. It was also a real pleasure to see so many Oxford Water MSc graduates at the meeting with at least 11 attending, representing their current organisations such as the World Bank, OECD, National Governments and Water NGOs from around the world. The evening get together on a Thai Boat in a Swedish Harbour was a great way to celebrate their success. 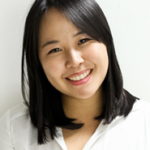 Jaeyoung Lee, who is a member of the MaRIUS project, received funding from the project to present her research at the 2018 Europe-Korea Conference on Science and Technology held in Glasgow, 20-24 August 2018. She describes her experience below. Every summer, the Europe-Korea Conference on Science and Technology (EKC) brings together Korean scientists and engineers studying and working in Europe and in Korea. The conference aims to foster and develop new relationships, exchange knowledge and ideas and to promote science and technology that is of service to society. It also attracts European scientists and engineers interested in collaborating with Korean nationals. This year marked the 11th EKC, and it was held in Glasgow, UK from the 20th to the 24th of August 2018. Science and Technology sessions provide an excellent opportunity for participants to exchange state of the art knowledge in comprehensive scientific areas ranging from basic science to engineering and policy. Ten groups with 42 specific sessions were on offer this year and my presentation was included in the basic science group, and the ‘Water on Earth: Rain, River and Ocean’ session. Many speakers were talking about their research within the Korean context, or Europe-Korean relationships or possible collaboration projects, whereas I shared my research in the UK context as part of the UK Drought and Water Scarcity programme. I opened the presentation with a question, “Is there a drought in the UK?” As many of the Koreans in the audience are living in Europe and the UK and have experienced another dry and hot summer this year, a few started nodding, and many of them were curious about UK droughts. I started my presentation with how the MaRIUS project has started, and what we have been doing. I then brought the audience’s attention to my research on the ‘Dynamic water quality modelling in the Severn-Thames river systems and assessment of the impact of a water transfer in drought’. 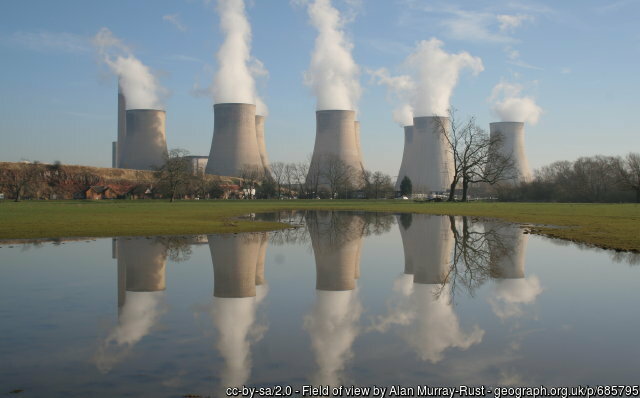 Inter-basin water transfer schemes have been discussed to tackle concerns on sustainability of water resources in the UK, and the Severn-Thames transfer scheme is one of the water resource development options under consideration by the Thames Water Utilities. The occurrence of severe drought events in past and climate change have highlighted the need for such transfer schemes. Key issues to examine and resolve relate to understanding water availability, water quality and the potential adverse biological impacts and it is important to ensure that both donor and receiving rivers are not adversely affected by the scheme. To explore possible risks and impacts of a water transfer on the Severn and Thames system, I applied newly developed MaRIUS climate change projection data (Weather at Home 2; W@H 2) to a hydrological model as well as a water quality model and then considered a set of hypothetical water transfer scenarios. I focused on my methodology and preliminary findings on water quality impacts including Dissolved Organic Carbon (DOC) concentrations in both river systems, which was driven by w@h 2 climate data. I got a few questions after the presentation, and the one we needed to discuss more was ‘the definition of drought’. As drought can mean different things to different people and is therefore defined in many ways, I explained the type of droughts including meteorological, agricultural, hydrological and socio-economical drought and the relevant risks and impacts. I thoroughly enjoyed talking with people who are not familiar with drought research in the UK, but at the same time it was challenging to translate complex science into words that a more general audience can understand as well as find interesting. These are skills that scientists must develop to have any policy impact, so I thank the MaRIUS project for giving me this opportunity to do so. 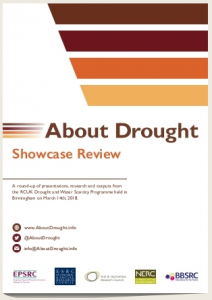 The About Drought Showcase Review is available as an online magazine , featuring the high quality inter-disciplinary content from the About Drought Showcase held in March 2018. It is packed with useful presentations, links and information for people who attended as well as for those who did not. The Showcase Review also gives a detailed introduction for anyone new to the programme and its work. The purpose of About Drought is to share information, tools and datasets from the programme, continuing stakeholders engagement and further supporting evidence-based decision-making for the management and planning of drought and water scarcity. 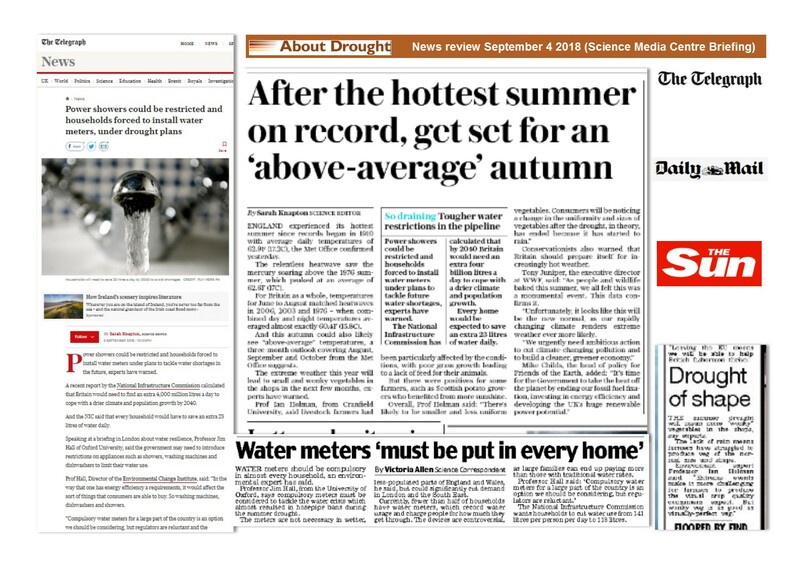 Three experts from About Drought provided journalists with an insight into the impact of the UK summer drought – Jamie Hannaford, Professor Jim Hall and Professor Ian Holman. Answering questions from the Daily Mail, Press Association, BBC, Telegraph and Financial Times they presented detailed but accessible information on the pressure on water resources, highlighting the way new data from the programme is already supporting decision-makers, such as the Environment Agency. Articles were published in the Daily Mail, The Sun, Telegraph and Mail Online. The About Drought programme collaborated with the British Hydrological Society, University of Reading and University of Loughborough to present a national workshop on seasonal forecasting. The aim of the workshop, held in Loughborough in January 2018, was to focus on the seasonal forecast needs of users and practitioners, and to identify ways of improving the dissemination, uptake and operationalisation of seasonal forecasts by the water and agricultural sectors. Reliable seasonal forecasts can support planning of water resources for a variety of purposes, including allocation for urban and rural water supply, irrigation scheduling, reservoir operation, routine maintenance of infrastructure, and preparedness for hydro-meteorological extremes. In recent years, improvements have been made in seasonal forecasting skill. However, without translation of these state-of-the-art forecast products into direct, actionable information, little ‘real’ progress can be made. 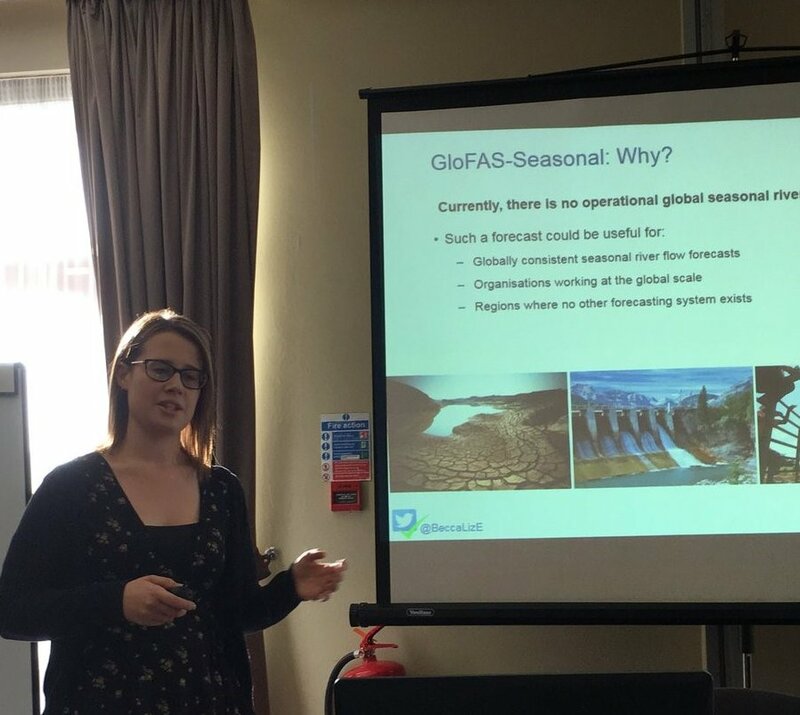 Rebecca Emberton (University of Reading) is pictured discussing global scale seasonal hydrometeorological forecasting with the Global Flood Awareness System at a national workshop on seasonal forecasting. 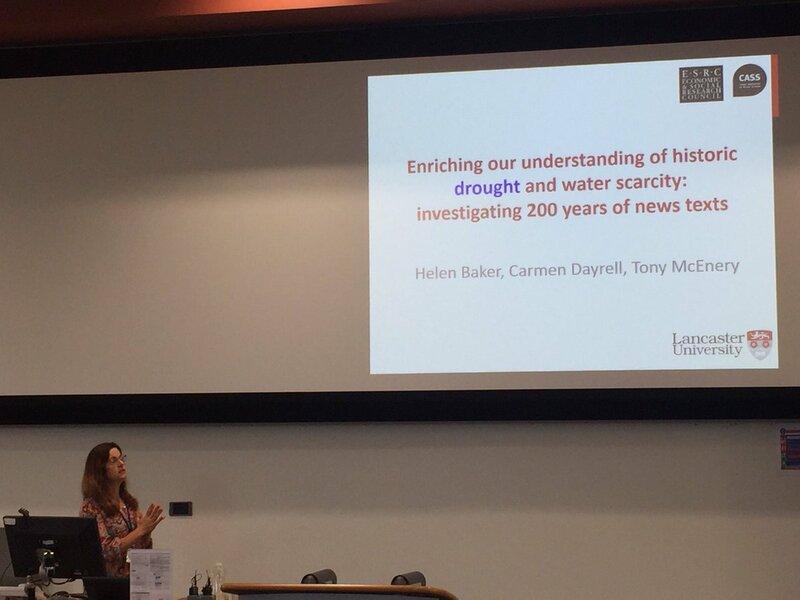 Carmen Dayrell from the ESRC Centre for Corpus Approaches to Social Science (CASS), Lancaster University, has presented her work with Helen Baker and Tony McEnery on a diachronic analysis of newspaper articles about drought and water scarcity at the 9th International Corpus Linguistics conference (CL2017). Corpus linguistics is a methodology for the systematic analysis of large amounts of empirical data to study language. The CL2017 was hosted by the University of Birmingham, from 24-28 July 2017. 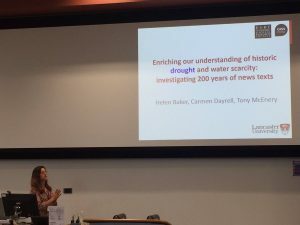 Entitled ‘Enriching our understanding of historic drought and water scarcity: investigating 200 years of news texts’, the paper discussed the media representation of drought and water scarcity throughout the United Kingdom, covering two hundred years of newspaper data, from 1800 to 2014. The results showed that, throughout the entire period, drought events were portrayed as intense and prolonged, with negative impacts of across the country, especially England. But the analysis also unveils some interesting shifts in the discourse. While references to drought the 19th and most of the 20th centuries overwhelmingly related to lack of rain, the word drought started to be used increasingly more frequent as a metaphor towards the end of the 20th century. These mainly related to sporting achievements (e.g. goal, trophy or scoring droughts) and finance (credit, mortgage droughts). Another clear shift relates to people’s concerns. In the 19th century, the newspapers frequently mentioned the impact of droughts on farming and agriculture. From the 1990s onwards, the focus seems to have shifted to constraints and limitations in people’s daily lives due to shortage or rationing of water, which in turn led to the introduction of hosepipe bans or the use of standpipes. Concern over the impact of droughts on plants and gardens has become one of the major topic in the contemporary broadsheet papers and tabloids. How best do we connect a diverse range of publics and communities with research arising from the NERC Drought and Water Scarcity research programme? This was one of the themes discussed at the first Community Stakeholder workshop held at the University of the West of England, Bristol on 27th October 2017. 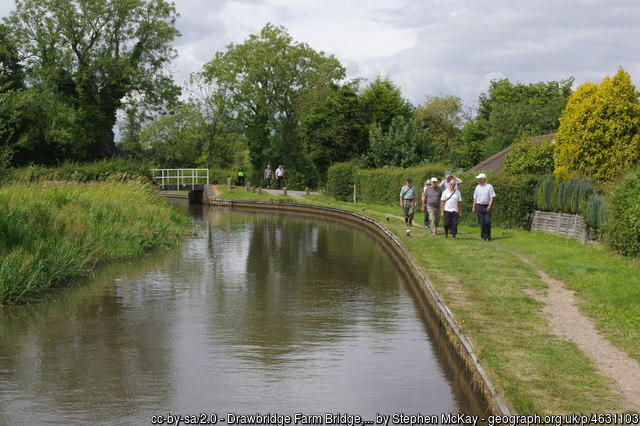 Stakeholders represented a range of organisations interacting with public and community groups, from water companies and local government to wildlife trusts. 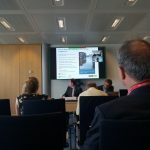 Discussions highlighted the need to move beyond the ‘usual suspects’ in knowledge exchange and tackle those groups able to make water savings, but who have little recognition of the increasing risks of water scarcity in Britain. The need for sustained interaction with key intermediary groups and gatekeepers, as well as production of targeted and tailored materials for those with different prior levels of capital or interest also featured in the wide-ranging discussions. This group will form the basis for building a ‘community of practice’ developing and testing evidence that can be used in engaging publics/communities in drought risk decision-making. The diversity of different types of business, water use and hence vulnerability to drought and water scarcity was acknowledged; it was also recognised that there will be opportunities for some businesses. The need of some businesses for information to fill the ‘blind spot’ between weather forecasting (which becomes unreliable after 2 weeks), and seasonal forecasting (which is more reliable 3-4 months ahead), which would allow them to plan more effectively. There are also issues with the ability of current science skillsets to fill this gap. There is a possibility to group, and communicate with, businesses via the type of water extraction they use primarily: groundwater, surface water flows, storage reservoirs. It can seem counterintuitive or be publically unacceptable that water scarcity measures need to be implemented in winter (perhaps when it’s raining), when water stocks are at their lowest. There was a feeling that it was easier to communicate about drought when it felt intuitive to do so (during hot, dry weather), and so these opportunities need to be maximised pragmatically by businesses. It is also necessary to bust some myths regarding droughts only occurring in summer! 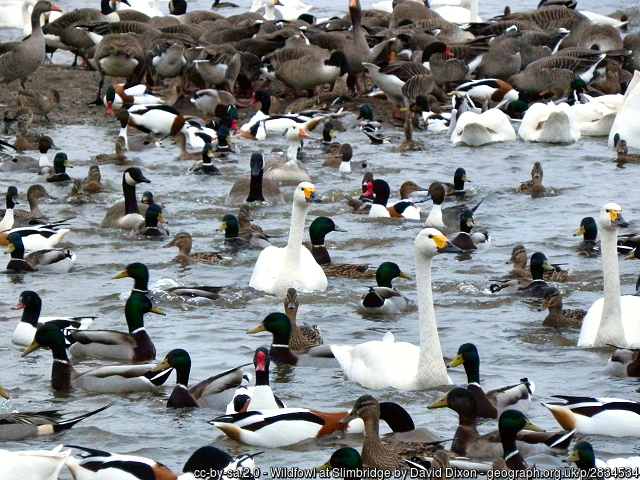 Much of the focus so far has been on the quantity of water resources, but there is now more attention being given by businesses to water quality – and also to the way low flows may impact on filtration systems via, for e.g., eutrophic blooms of certain organisms. Trade-offs between using water for cooling systems, for example, and alternatives, must be balanced – as many alternative coolants may include harmful chemicals or require greater energy use. Several in the group deemed it important to take account of the way information about water actually travels to consumers – often via intermediaries such as water retail companies or agronomists – rather than being conveyed directly from suppliers. It was seen as essential not to create yet another selection of disaggregated tools, but to think about what integrated platforms the DWS outputs can build towards. One such example platform is the US government’s National Integrated Drought Information System, where visitors can drill down to find out more about drought in their region. Sharing data from locally collected sources on central, open platforms was seen as important, yet there are disincentives for businesses to cooperate, as it may put them at competitive disadvantage. Workshop discussions also emphasised the need to make case studies and information relevant to specific business sectors, and a case for ‘knowing your own water data’ – i.e. encouraging scientific measurement within businesses, rather than this being outsourced and therefore distanced from the people with the greatest interest in the business. MaRIUS LIVE! Managing the risks, impacts and uncertainties of droughts and water scarcity was held on the 2nd of November 2017. 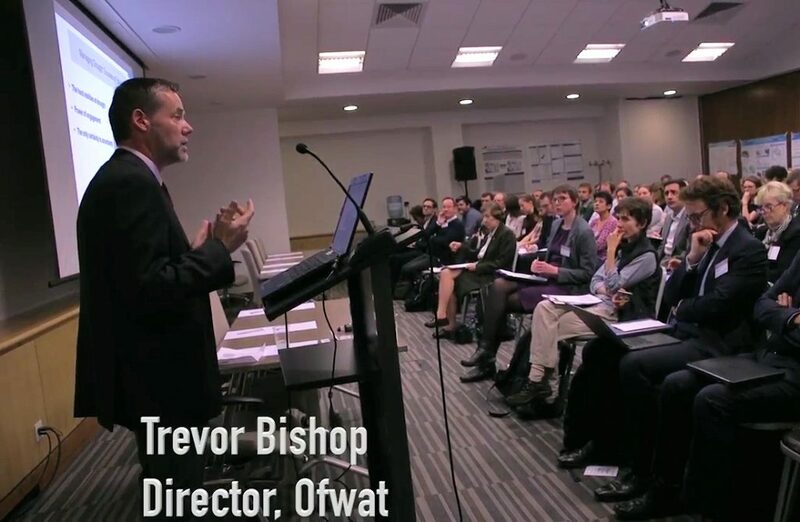 Trevor Bishop, Director of Strategy and Planning at OFWAT, described MaRIUS as “one of the most important bits of research that we’ve seen in drought and water scarcity” as more than 80 delegates met to hear presentations setting out the findings of the project’s research and the outputs available for use. Trevor gave the opening address with Professor Jim Hall, Director of the Environmental Change Institute at Oxford University, PI of MaRIUS, summarising the project for audience members representing water and energy companies, regulators, consultancies and researchers. The project researchers took the opportunity to outline their findings on the effect of drought on people and the environment, covering topics of governance, communities, drought management , hydrology, water quality and resources, aquatic and terrestrial ecology, agriculture, the economy and electricity supply. Feedback from the half-day event has been very positive with the project’s datasets generating particular interest. Films will shortly be available from MaRIUS Live! One giving an overview and flavour of the event – including an interview with Trevor Bishop on the value of MaRIUS – and the others featuring the series of presentations. All links will be published here on AboutDrought and the MaRIUS website. If you attended MaRIUS LIVE! But have not yet given your feedback, please complete the feedback form. The post event delegate pack, including slide presentations and other materials, are now available. Links to Videos of the presentations are listed on this website. For more news on MaRIUS visit the project website.